I like starting new traditions. and ornament suggestions for the Jesse Tree. The year before that, we started eating birthday cake for breakfast on Christmas morning for Jesus! I started off talking about whose birthday was coming up. What do you do on birthdays? How do we give presents to Jesus who is invisible? How do we give to the King? This is how we give to the King. We love and care for others. Sacrifice. Service. Chores without grumbling. Servant’s hearts. Loving attitudes. Cultivating a spirit of self-sacrifice is hard for us – harder still for children during this season and in this consumeristic culture, who are marketed to constantly. We hope the visual reminder of the shepherd’s pouch being in view, front and center, during these weeks helps us to maintain focus. And so…imperfectly, we remind ourselves that the magnificent event we celebrate on December 25 began with Someone’s fierce and determined desire to love a faraway people. *I painted the canvas in the picture as another visual reminder of why there are pouches instead of stockings hanging over the fireplace. 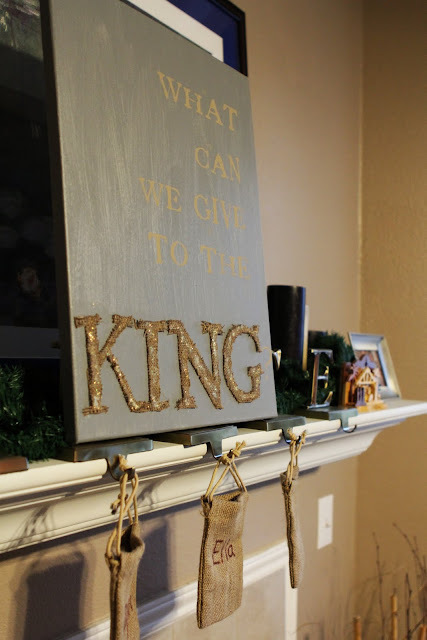 I used burlap for the word “King” from the extra pouches that came with the ones I ordered. 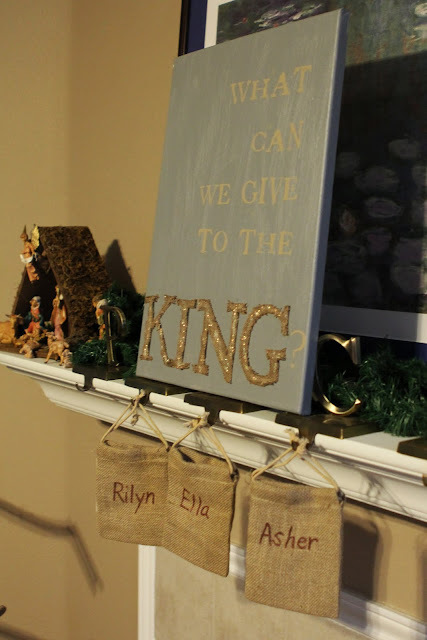 I decoupaged the letters to the canvas and sprinkled some glitter over the burlap to give it an extra emphasis. **When the kids wake up on December 25th, the pouches will be replaced by their stockings full of fun little goodies! Time to celebrate! ***This was the outcome from shepherds pouches 2011: They made $18 in December in their shepherd’s pouches. My favorite part was their public school teachers e-mailing us throughout the month with actions they saw at school that showed a servant’s heart from my girls. Both teachers really got into it, and I loved that we could share this experience with them! Sadly, the girls didn’t have enough money to buy a goat this year, but they had enough to buy a chicken! Maybe next year! This is just wonderful!!! And on a separate note, it brought me joy to see the little angel ornament hanging from your tree in the previous blog pictures that we had given you guys a few years back 🙂 I miss you guys!!! Saw your post on Tip Junkie. Wow. Thank you for sharing this tradition. I’ve never heard of anything remotely close. My DS is too young to understand this now, but this will definitely be implemented next year. I pinned this so I’ll not forget. I saw this via pinterest and I love it! We also do a birthday cake for Jesus on Christmas Eve and a Jesse Tree, I plan on adding this as well. What an amazing way to keep Christmas centered on Christ!!! thank you for sharing such a wonderful tradition. Next year will be a perfect year to start this. This year is the birthday cake for Jesus. That’s a wonderful idea; one that I will keep in mind for next year! That really is a wonderful, wonderful idea! Thanks so much for sharing. I would love to do this next year! Now this could be the tradition that blows the elf OFF the shelf! Such a real purpose in turning our focus to The One Whom is the Real Reason for this season! Thank you for sharing this! I wanted something to deepen the meaning of Christmas for my family…we also do the Jesse Tree (along with Ann Voskamp’s Cradle to Cross Wreath) and Jesus’ Birthday Cake (a tradition MY parents started with us when I was a child). We also choose gifts from the World Vision, TOMS, and Compassion catalogues. Next year, we will be adding Shepherd’s Pouches to our traditions to make a family gift to one such organization. You know? I just had a thought. I don’t have to wait until next December to start this! Technically, it’s still the Christmas season…with the 12 days of Christmas, we have 11 days left (until January 6th, the day of Epiphany). We are going to start it now!! I LOVE it! A lovely way to train our children to remember and to give. What a great idea! My daughter is grown now, but I was never comfortable with stockings so we’ve never hung them…like to keep the focus where it should be! Love the shepherds’ pouches idea. Began a similar tradition this year that was inspired by the same verse. Love it! Love this! What a great way to teach about giving and serving and to put Jesus in the spotlight during Christmas. Wow! What an amazing idea! Found this on Pinterest and I canNOT wait to start this tradition with my family! So lovely and inspirational. My family will be doing this in December. Thank you so much for sharing! I am SO in love with this idea it’s brilliant! I’m so glad to see families trying to keep the true Christmas meaning in the fact that its about CHRIST. I will keep this in mind for when my little one gets a bit older. Thanks for the inspiration!! What a fabulous idea!!! Thank you for sharing this tradition! Praying you and your family enjoy another *wonderful* celebration this year! My children are pretty little and haven’t learned about money denominations yet. I’m thinking of putting a jar near the kitchen table, and putting plastic coins in there when I see them serving each other. That would get the same idea across without having to hunt up burlap bags this year. I love your tradition…would like to see more families start a Godly tradition…We need to get away from all the comercialism…and back to the true meaning of Christmas! Thank you for sharing and May God Bless your efforts in all you do! I’m so excited to be trying your idea this year! Thank you for sharing it with us! My husband and I LOVE this idea…. I hate how CHRISTmas these days are so commercialized… It seems so hard to teach our kids what Christmas is all about when Santa and new toys are shoved down their throats on TV and in school! THANKS so much for this idea…..I know what I’ll be doing this evening!!! I love this and I’m definitely pinning it on Pinterest!! Made me a little teary! Thanks for sharing! !